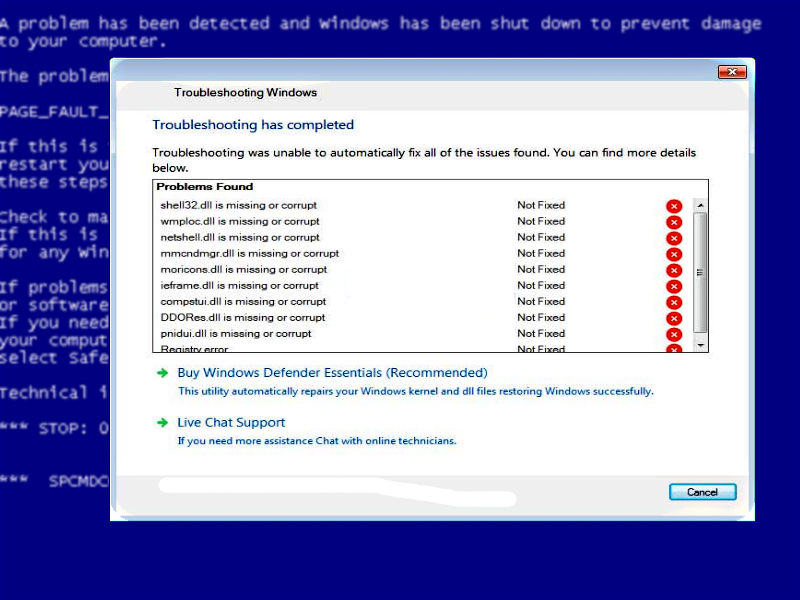 What is Windows Troubleshooting alert? Windows Troubleshooting scam is a virus that crashes your operational system, showing a fake Blue Screen of Death (BSOD). It causes the system reboot, after which it displays a lock screen. Some users believe that the system encountered a serious error. The alert looks real, as it copies the layout of the real BSoD, hides the mouse cursor and blocks the Task Manager. To resolve the issue the user is offered to buy Windows Defender Essential utility or to apply to the fake live support chart and get help from technicians. However, instead of providing helpful instructions, people from so-called technical support doesn’t answer to you or offers a fake link to purchase windows defender essentials program. Our advice, if you have this problem on your system, don’t turn to that links, because you will be redirected to a PayPal page where they request you buy “the program” for $25. The page that is opened is for lillysoft.it@gmail.com. So, you’d better try to remove Windows Troubleshooting Scam by yourself. How Windows Troubleshooting message appeared on your computer? This infection can appear due to careless web surfing which is the method way threats like this one use to get inside the computer. Clicking on suspicious links, visiting infected websites and opening attachments from an unknown sender is the activities that you shouldn’t practice if you want to keep your system safe. And to avoid the most complicated and disguised hazards you need to set a shield of antivirus programs. How to remove Windows Troubleshooting scam? We should warn you that performing some of the steps may require above-average skills, so, if you don’t feel experienced enough, you may apply to the automatic removal tool. Performing an antimalware scan with WiperSoft Removal Tool would automatically search out and delete all elements related to Windows Troubleshooting scam. 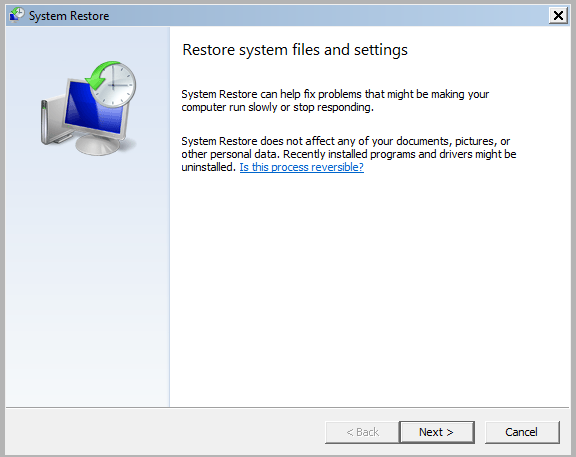 It is not only the easiest way to eliminate Windows Troubleshooting, but also the safest and most assuring one. Then click Ctrl + O keys on a fake PayPal purchase screen. Enter http://hitechnovation.com/thankyou.txt into the Open dialog box. srvc.exe to kill Task Manager, Registry Editor, and Explorer. BSOD.exe to display a BSOD on the affected device. Troubleshoot.exe to deliver fake “Troubleshooting Windows” alert. Scshtrv.exe to upload a particular screenshot to the remote FTP server. adwizz.exe to display Banggood.com ads. Then type rstrui.exe and press Enter. 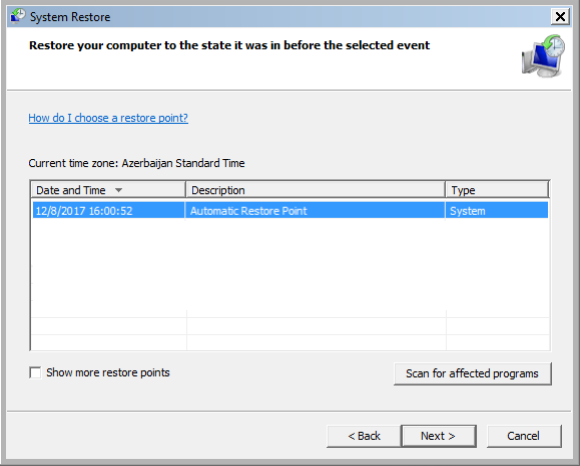 In a “System restore” window click Next and select your restore point that is older than the infiltration of “Windows Troubleshooting” scam. After doing that, press Next. We also recommend to download and use WiperSoft to scan the system after Windows Troubleshooting scam removal to make sure that it is completely gone. The antimalware application will detect any vicious components left among system files and registry entries that can recover Windows Troubleshooting scam.